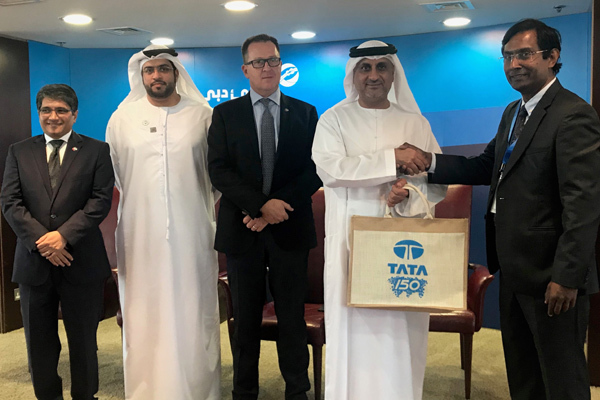 Dubai-based global marine terminal operator DP World revealed that its group chairman and chief executive officer Sultan Ahmed Bin Sulayem met with senior executives from India’s Tata Group to explore opportunities for cooperation, knowledge sharing and best practice. Discussions covered logistics and supply chain operations, innovative customer care and creating high quality, sustainable services, said a statement. The meeting was attended by Ahmed Al Haddad, chief operating officer, Jafza, and Mahmood Al Bastaki, CEO, Dubai Trade, it said. Bin Sulayem outlined DP World’s operations across 40 countries, and its role in enabling trade across the global supply chain by providing industry-leading services, including the Jebel Ali model of integrated port and free zone, which is now gaining popularity around the world, it added. The company has extensive business interests in India, including six container terminals, Inland Container Depots (ICD), warehouses and container rail freight services, supporting over 30 per cent of the country’s container trade. It recently acquired a 90 per cent stake in Continental Warehousing Corporation, an Indian logistics firm earlier this January. NIIF, India’s first sovereign wealth fund and DP World had announced the creation of an investment platform Hindustan Infralog to invest up to $3 billion in ports, terminals, transportation and logistics businesses in India. The Continental acquisition will be the first investment of the platform. The Tata delegates toured Jebel Ali Port and Free Zone, including Terminal 3 (T3), the world's largest semi-automated container handling facility with an annual capacity of four million TEUs (twenty-foot equivalent container units), said a statement. They were briefed on the operational efficiencies of T3, where capacity was increased by 1.5 million TEU last year in response to the high levels of utilisation at the port and with the recovery in volumes, particularly in the lead up to Expo 2020, it said. Indian container imports at Jebel Ali Port have increased annually in the past four years from 205,000 TEUs in 2013 to 254,000 TEUs in 2017, while exports reached 132,000 TEUs. “We believe that our both companies can benefit through exchange of knowledge and know how, sharing expertise and experience in areas that deliver solutions to India's growing economy and trade,” he said. “We are working to expand business relations with India in line with the directives of HH Sheikh Mohammed bin Rashid Al Maktoum, Vice President and Prime Minister of the UAE and Ruler of Dubai,” he added. “We aim to share insights on our successful business model in line with the Dubai government’s 2021 policy, and the UAE's post-oil strategy to create a sustainable knowledge-based economy,” he concluded. Jebel Ali connects more than 8,500 companies with trade partners from across the world, moving cargo to and from the subcontinent. It underlines the major role played by the port as a logistics location enabling regional and global trade. Jafza is home to 788 Indian companies from a range of sectors, with many customers operating in faster growing regional markets.